Front Row, L to R: Vice President Emily Myers Garner '95, Immediate Outgoing President Anghaarad Teague Dees '95, President Lillian Harris Wade '63, President Elect Neely Woods Hunter '95. 2nd Row L to R: Treasurer Deborah Stockman Hodges '90, Director Del Oehms Hamilton '84, Director Shirley Rutherford Spain '64, Director Jimmie Meese Moomaw '58, Director Erin Gioia '07, Secretary Wanda Ray '63 & '75. 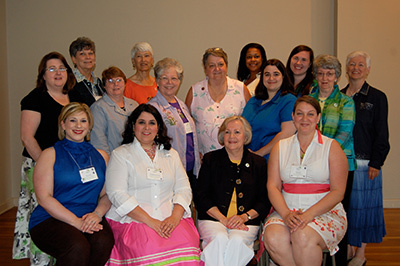 3rd Row L to R: Director Lenore Shields Griffin '70, Past Presidents' Director Bev Koch Jones '57, Director Kimberly Griffin '93, Chapter Reps Director Patsy McDaniel '63.